Magical Moments line from Moxxie! 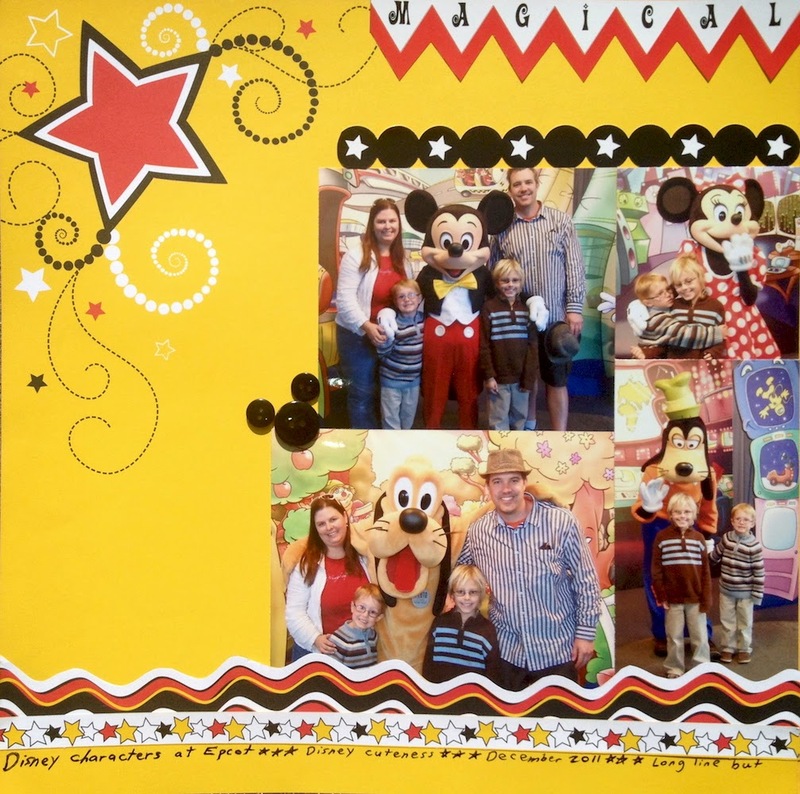 For this layout I used the A and B side of Dreams Come True and the Magical Cutouts. And of course I had to bling it up. When my daughter was 4 years old we took her to Disney World. We had lots of fun riding in the teacups, eating at the restaurants and shopping at all the gift shops. One of Megan's favorite things was when the characters signed her autograph book. I decided to make a keepsake for my desk using this photo of Minnie signing Megan's book. I am so excited about Moxxie's new Disney line called Magical Moments! The line is fabulous, colorful and perfect for my Disney pictures. I began my project by punching the large doily from the b side of the Daisies paper. Next I die cut a red scalloped circle from the Wishes paper. I cut the circle in half and tucked the pieces behind my photo. A star punched from the b side of the Wishes paper and a red heart were pop dotted to the piece. A small black bow and the "Let the Adventure Begin" sticker were added last. The top of the piece was done. The base of the metal piece was already painted red, however, it needed something more. I got out my flower punches and the Magical Moments papers and got to work. I layered the base with flowers, pop dotting them and adding enamel dots to the centers. I'm really pleased with my finished project. 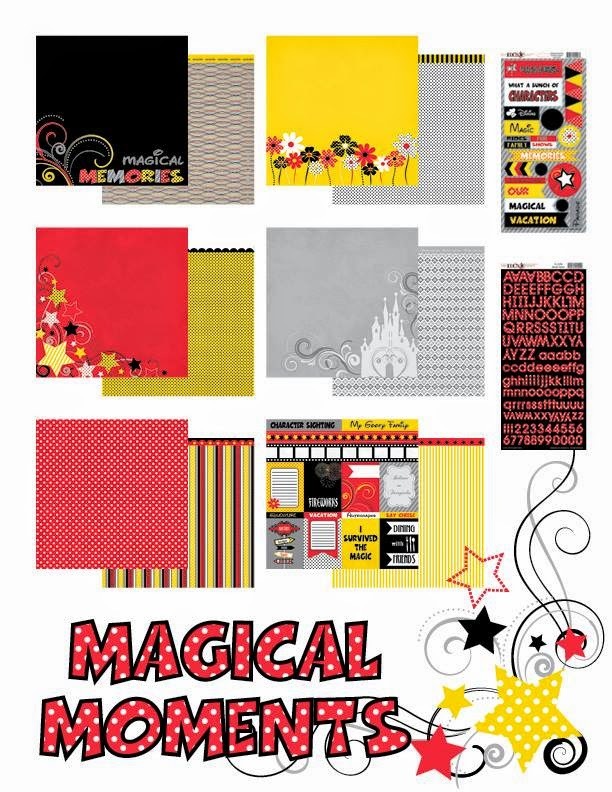 I loved using the Magical Moments papers and stickers - and I'm sure that you will love them too! Have you checked out our Card challenge? Enter on this post. 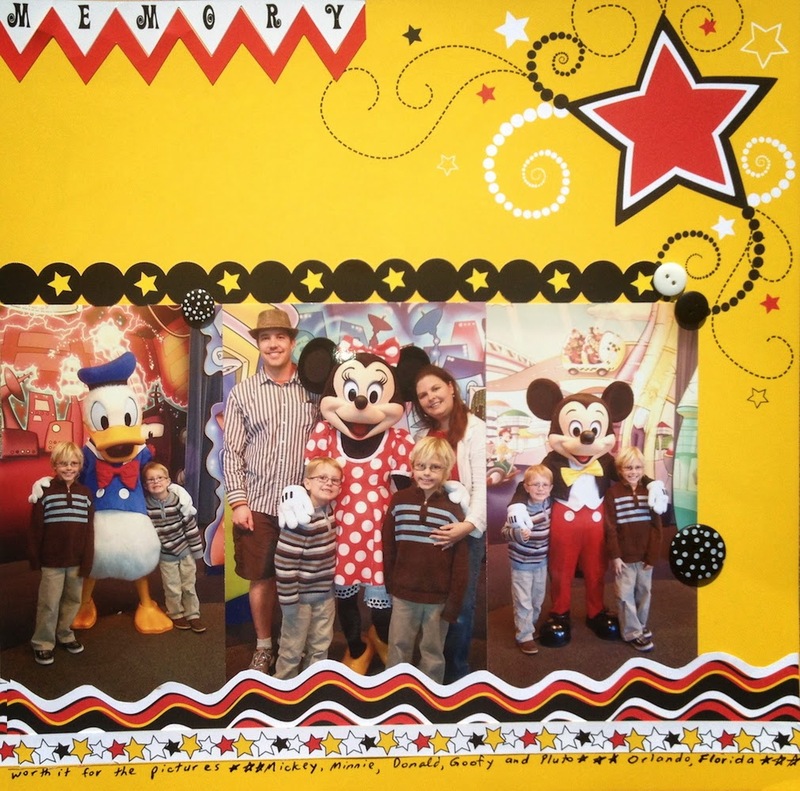 We, like most people, LOVE a good Disneyland trip!!! And, we always take a TON of photos!! We used to live out of state and so we never knew when we'd get to go back. Then we moved back to California, and got passes for a year, and we used them a ton!!! It was great. These are some older photos from a Disney trip back in 2009 of our older kiddos. 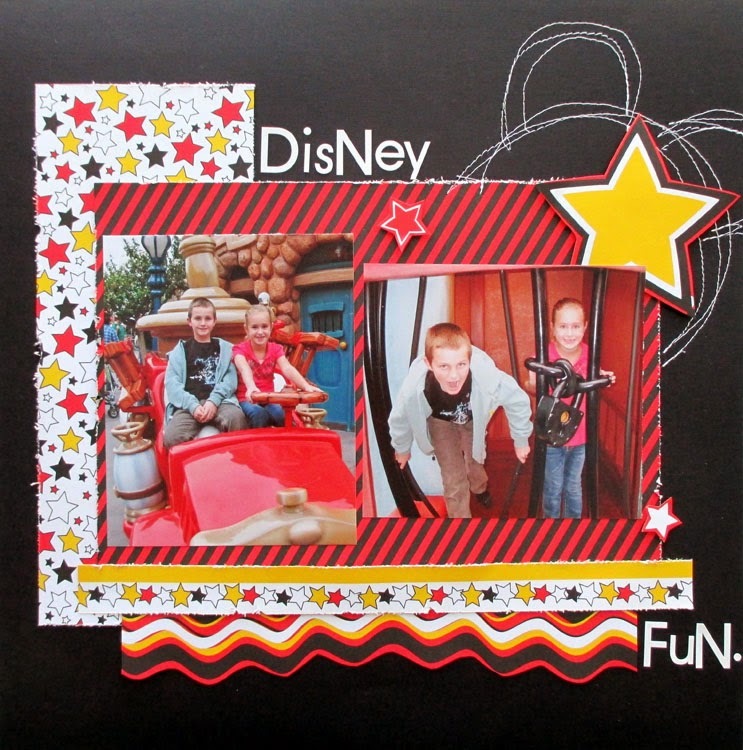 I used some of the Magical Moments line for the page, which is perfect for Disney photos!!! I attempted to freehand sew some Mickey ears on the side of the page... not sure it totally worked, but it was worth a try. I really should just take stock in this collection, I have sooo many Disney pics.. LOL!!! Thanks sooo much for stopping by and have a great day!!! Just a few days left to enter to WIN! Hey Mickie, You're so fine, you're so fine- you blow my mind. MOXXIE has some great lines- both new ones and older ones. 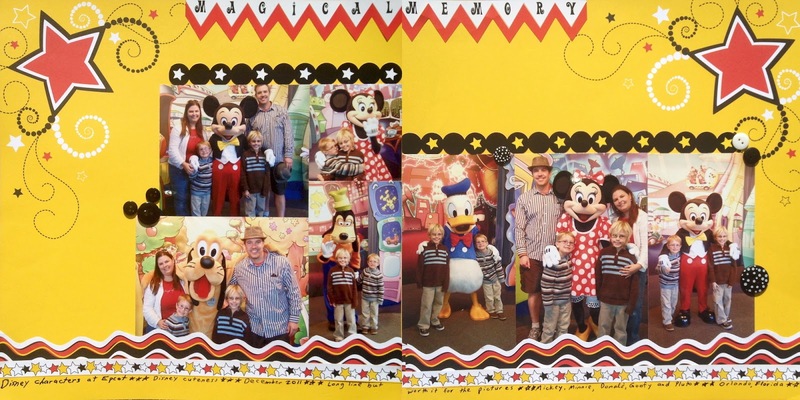 I found this Magical Moments line that is PERFECT for the Disney pictures that I'm currently scrapping. They made it so easy. I scrapped this double pager in less than an hour. Ask your local scrapbook retailer if they have MOXXIE in stock. It's so easy to use and packs a punch with great colors. Hi all, how is your summer going? I can't believe summer is half over already! my favorite part of summer is getting outside more. 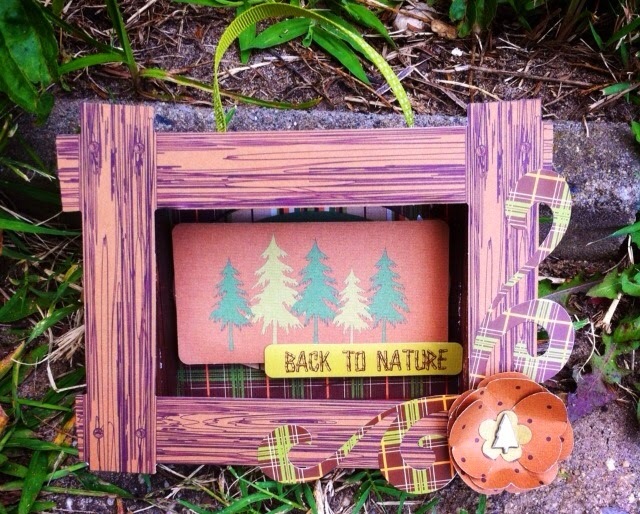 So i thought to get the feel of bringing the outside in when I have to be inside would be to make some fun home decor. 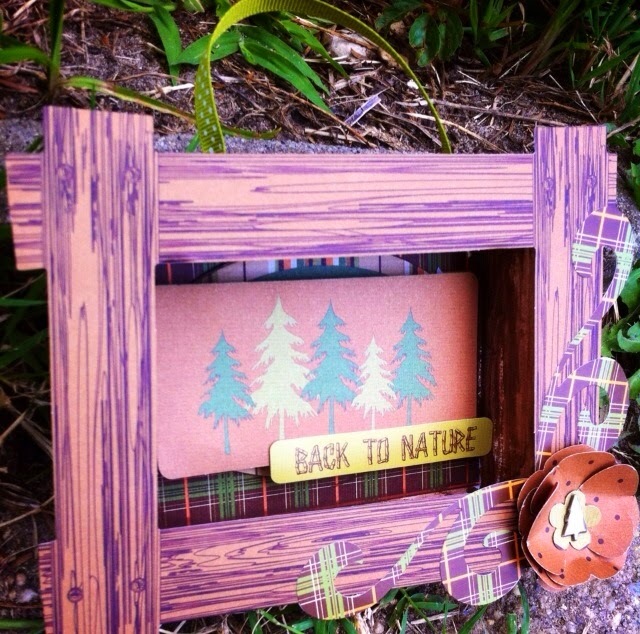 So, i used the happy camper collection to make a fun little shadow box to hang in my hallway. 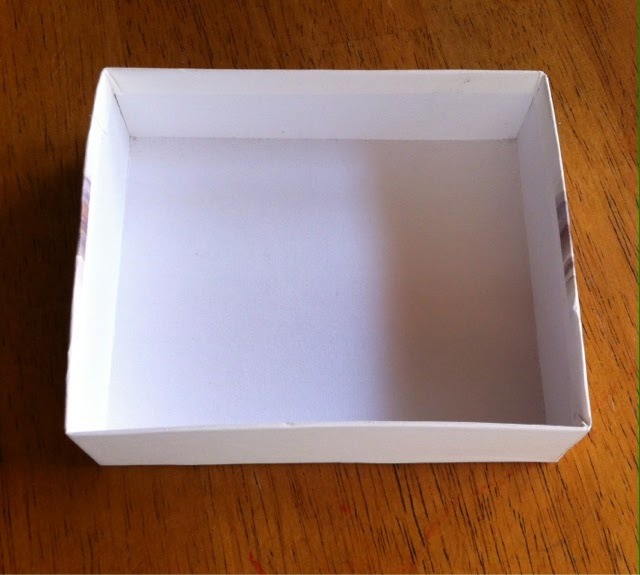 I first, grabbed an old watch box lid that i had (the other half i used on a past project) so it is a two-fer and up cycling in one. I then grabbed my brown acrylic paint and rubbed it all over the box for a distressed look. 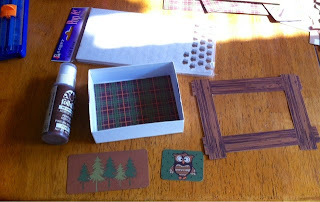 Next i looked at the die cuts and saw the wood look frame... the size matched the box (i lucked out) then i grabbed some more die cuts and papers to try and started adding the layers. 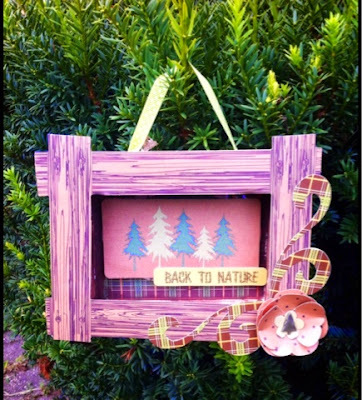 On the inside is the green plaid paper followed by a oval die cut and then the tree die cut with pop dots behind it . Next, i added a back to nature sticker on top with pop dots behind also. I then glued the frame die cut on the edges and added a flower i made using the pretty brown polka dot paper and a butterfly punch and added a tree brad to hold it all together. Lastly i added the swirls next to the flower and tied a ribbon to the top. Oh! I almost forgot, the striped banner sticker i wrapped around the edges to finish it off. Thanks for stopping by and happy creating!! --jen t.
Don't forget to enter our summer time blog hop giveaway! Hi, it's Joan and today I'm sharing a Camping Journal I decorated for a friend of mine. She and her husband go camping almost every week- end. I thought this would be a great way for them to document their trips. 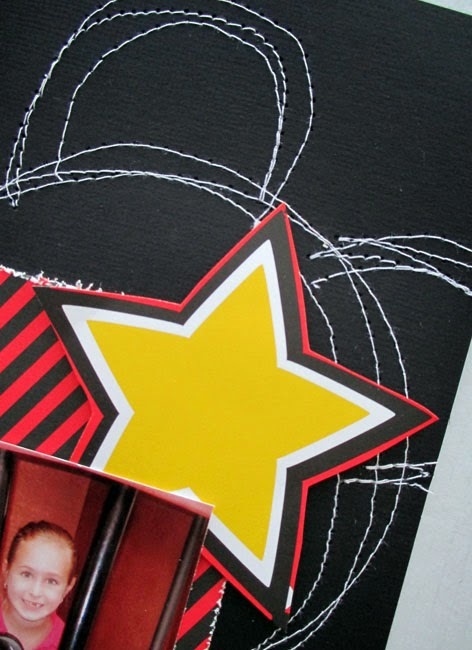 I used the Happy Camper and Busy Boy collections for this journal. Composition books (like the one pictured below) are easy to decorate. I cut the orange paper from the B side of the Little Monster paper to fit the cover, up to, but not including, the black binding. I adhered the paper with adhesive squares. 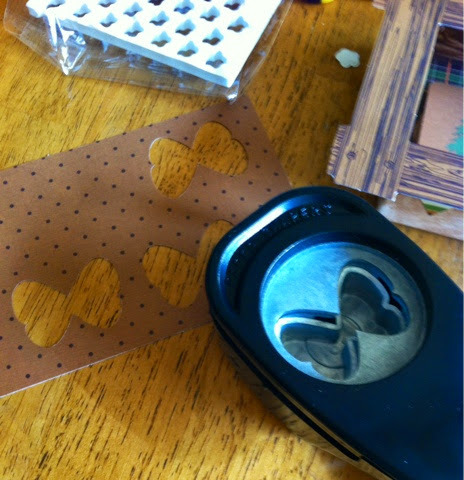 You could also use a glue stick or Elmer's glue - just be sure to smooth out the paper if glueing. Next, I used washi tape from my stash and covered the black binding. I also ran washi tape around all the edges, partway on the paper and then tucking the rest behind the cover. The rope border punchout was added over the seam of the washi tape. The embellishments (punchouts: owl, around the fire, frame and sticker: Camp Out) were added to the cover - some with adhesive squares and some with pop dots. Then I used punchouts and a sticker to make tabs for the book. I divided the book into three sections and added a tab at the beginning of each one. 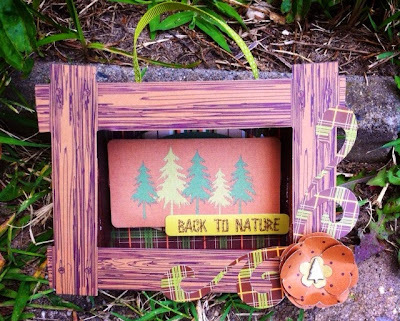 The Back to Nature sticker was backed with cardstock to make it sturdier. That section of the journal can be used for birds, insects, animals, flowers, etc. seen while camping. The marshmallow on a stick tab is for camp recipes. The Hiking tab is to document campgrounds, trails walked and even favorite campsites. I made a bookmark for the journal, using a section of the pine trees from the Gone Camping paper. I inked the edges of the paper and mounted it to brown cardstock. It's fun to personalize journals for friends and yourself! Who's on vacation? Anyone going somewhere tropical? Maybe you're like me and dreaming of a beautiful, ocean getaway? Well, at least the weather here in the Midwest is cooperating for a "tropical" feel, lots of humidity and plenty of heat! But no matter, I will sip a fruity drink in the air conditioning and let my hair frizz and put together a tropical paradise layout. Ms Luau is a fun layout using Moxxie Paradise Found papers and stickers. 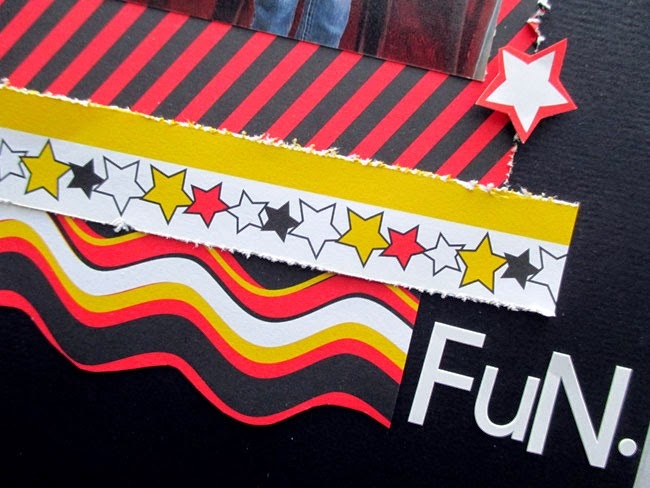 Instead of photos inside the filmstrip, I added small patterned paper. It's a subtle detail that makes a nice border. I added a lot of clusters, shells, flowers, and these really fun stickers that came with the paper line. And lastly, the alphas were perfect for using in my title. Look at these gorgeous, happy women, I will drink pineapple juice to that!